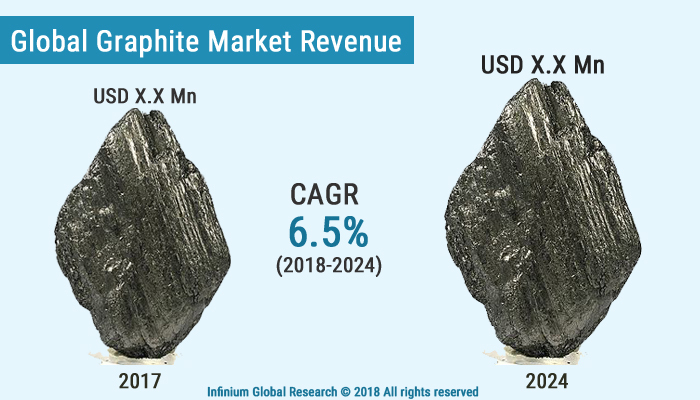 A recent report published by Infinium Global Research on graphite market provides in-depth analysis of segments and sub-segments in global as well as regional graphite market. The study also highlights the impact of drivers, restraints and macro indicators on the global and regional graphite market over the short term as well as long term. The report is a comprehensive presentation of trends, forecast and dollar values of the global graphite market. According to report, the global graphite market is projected to grow at a CAGR of 6.5% over the forecast period of 2018-2024. Graphite is the naturally occurring mineral with pure carbon. Graphite is formed naturally through the metamorphism of carbon-rich materials in rock. The graphite is in either crystalline flake graphite or fine-grained amorphous graphite or crystalline vein or lump graphite form. Although, graphite is a non-metal material it has very similar properties as that of metals. The graphite offers excellent heat and electricity conductivity, high strength and stiffness, high resistance toward the high temperature and chemical attack as well as it has natural lubricity. Rapidly growing usage of graphite in the battery and the automotive sectors are the factors driving the growth of the graphite market worldwide. In the battery industries, the graphite is used to construct the electrodes in batteries. The rising use of smartphones and tables contributes to the growth of the graphite market as the graphite is used in the manufacturing of lithium-ion batteries. The graphite used as Refractory material in the automotive, chemical and other industries as they have high resistant towards heat, pressure, or chemical attack so they used the information of structure and components that are exposed to extreme environmental conditions. In addition, the use of graphite in various industries including Steel, aerospace, marine, construction and others is likely to boost the market growth over the forecast period. Moreover, the rising demand for the high strength lightweight materials for the automotive and aircraft industries are projected to escalate the market growth between the forecast period. The versatile uses and application of the graphite is expected to create several opportunities for the graphite market in upcoming years. Among the region, the Asia-Pacific the region holds for the maximum share In terms of demand and Consumption as China produced around 70 to 80 % of the total world’s graphite. The rapidly growing industrialization creates the demand for graphite from various industries such as automotive, aerospace, construction and others, which in turn, is driving the growth of graphite marker in the Asia-Pacific region. The report on the global graphite market covers segments such as type and application. On the basis of type, the global graphite market is categorized into natural graphite and synthetic graphite. On the basis of application, the global graphite market is categorized into manufacturing of carbon brushes, refractories, electrodes, lubricants, friction product, pencils and others. The countries covered in the North America region include the U.S., Canada, and Mexico; while Asia-Pacific includes China, Japan, India, South Korea, Malaysia, and among others. Moreover, Germany, U.K., France, Spain and Rest of Europe are included in the European region. The U.S. drives the growth in the North America region as it is the largest market in the region. The Asia-Pacific region offers a substantial potential for the market growth owing to rapid growth in markets such as India and China. The APAC region is projected to experience growth at a CAGR of x.x% over the period of 2018-2024. The report provides profiles of the companies in the global graphite market such as GrafTech International Holdings Inc., Graphite India Ltd., Northern Graphite Corporation, Asbury Graphite Mills, Inc., Flinders Resources Ltd., Energizer Resources Inc., SEC Carbon Limited and SGL Carbon SE. The report provides deep insights on demand forecasts, market trends and micro and macro indicators. In addition, this report provides insights into the factors that are driving and restraining the global graphite market. Moreover, IGR-Growth Matrix analysis given in the report brings an insight into the investment areas that existing or new market players can consider. The report provides insights into the market using analytical tools such as Porter's five forces analysis and DRO analysis of the graphite market. Moreover, the study highlights current market trends and provides forecast from 2018-2024. We also have highlighted future trends in the graphite market that will impact the demand during the forecast period. Moreover, the competitive analysis given in each regional market brings an insight into the market share of the leading players. This report will help manufacturers, suppliers and distributors of the graphite market to understand the present and future trends in this market and formulate their strategies accordingly.